Expected Stock Market Returns = World Cup Champion? The world’s attention will stay tuned to Russia over the next month as the 2018 World Cup has officially begun. The 2014 World Cup final alone drew more than a billion viewers, with the entire competition reaching an in-home audience of 3.2 billion people. There’s no doubt it is the most widely popular sporting event in the world. Unfortunately, the United States did not qualify this year, but I like the team’s chances of competing in the 2026 World Cup! I can’t claim to be a big soccer fan, but the fierce competition of any large sporting event is always a draw for me. It parallels the competition innate in the investment management industry. Every day, active managers try to beat their corresponding benchmarks and peers. As it is often conveyed, alpha is a zero-sum game —there will always be winners and losers. 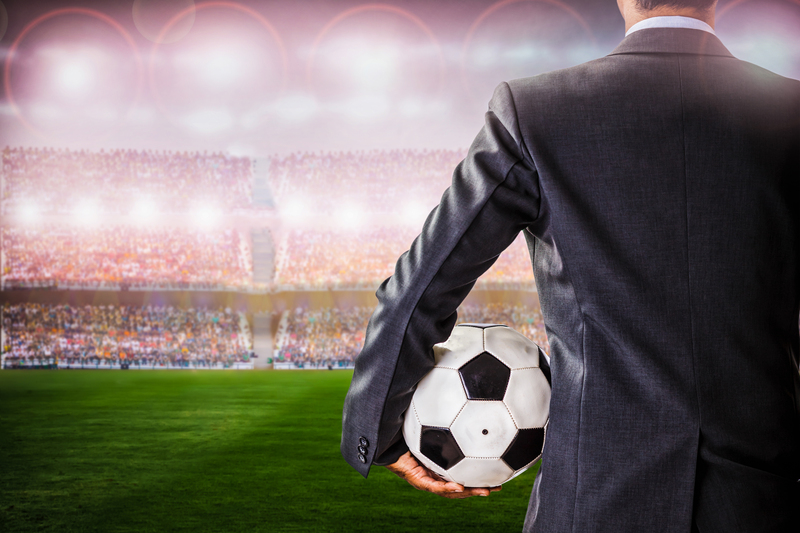 The World Cup and other large sporting events are exciting for other reasons, too. They offer opportunities for data geeks like us to apply our research and analytics techniques into building models to predict the champions. At CLS, we utilize a global investment universe, so we often consider specific country exposures and foreign markets. That makes the World Cup a perfect sample. Also, 23 of the 32 countries in the field can be represented by single-country ETFs. Those that don’t — Uruguay, Croatia, Serbia, Senegal, Iceland, Costa Rica, Iran, Panama, and Tunisia — are unfortunately left out of our analysis. But, luckily, none is a favorite to bring home the cup. In trying to predict the eventual World Cup champion, could expected market returns be an accurate catalyst? The chart below graphs each country’s expected return using our proprietary CLS Score* on the y axis with implied probabilities to win on the x axis. The results are a bit hit and miss. Mexico has the highest expected returns, but it is in the middle of the pack when it comes to odds to win the World Cup. On the other end of the spectrum, Germany has been given the second highest odds to win but has flat expected returns. There are a couple of countries that put the two together. Brazil, the favorite, has some of the highest expected returns at just more than 9%. Argentina also has high expected returns at 9.29% and was given the fifth highest odds to become the champion. Looking strictly at our explanatory variable, the favorites are Mexico, Russia, Argentina, and Brazil. 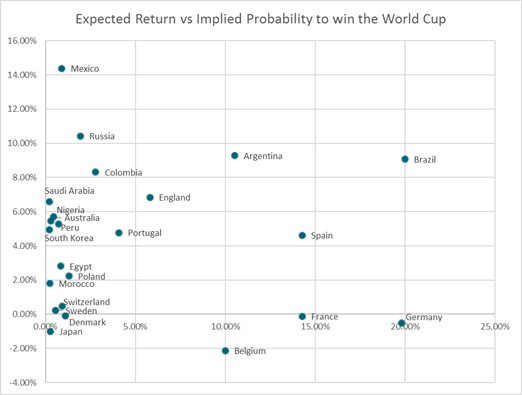 Overall, there appears to be no correlation between expected returns and odds to win the World Cup, but having the highest odds alone doesn’t crown the champion. Regardless of the outcome over the next month, the World Cup will be widely watched around the world. And we’ll be excited to see it play out — for the sport, the competition, and, of course, the analytical opportunities. While I’m not sure I would recommend basing any title predictions on expected returns, if Mexico is hoisting the cup in a month, don’t say I didn’t tell you so. *A proprietary expected return measurement CLS calculates as a complement to our Risk Budgeting methodology. It is constructed by first building a capital market assumption (CMA) for a broad asset class, then adding a valuation overlay, a technical overlay, and a cost adjustment for each ETF. The end result is an expected annualized return (the “CLS Score”) for every ETF we track.